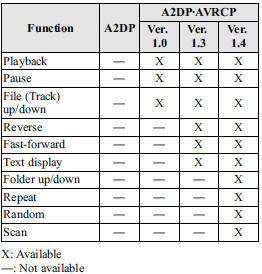 A2DP is a profile which transmits only audio to the Bluetooth® unit. If your Bluetooth® audio device corresponds only to A2DP, but not AVRCP, you cannot operate it using the control panel of the vehicle's audio system. In this case, the Bluetooth® audio device can be operated by controlling the device itself, the same as when a portable audio system without the Bluetooth® communication function is connected to the AUX terminal. 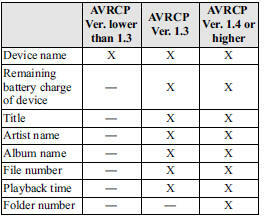 • To make sure that your Bluetooth® audio device is Ver. 1.0, 1.3 or 1.4, refer to the Owner's Manual for the Bluetooth® audio device. • The battery consumption of Bluetooth® audio devices is higher while Bluetooth® is connected. • If a general mobile phone device is USB connected during music playback over the Bluetooth® connection, the Bluetooth® connection is disconnected. For this reason, you cannot have music playback over a Bluetooth® connection and music playback using a USB connection at the same time. • The system may not operate normally depending on the Bluetooth® audio device. To listen to music or voice audio recorded to a Bluetooth® audio device, switch to the Bluetooth® audio mode to operate the audio device using the audio system control panel. Any Bluetooth® audio device must be programmed to the vehicle's Bluetooth® unit before it can be used. Refer to Bluetooth® Preparation on . 2. Turn on the Bluetooth® audio device's power. in the audio unit's display. ” symbol is displayed in the audio unit's display. to the Bluetooth® audio mode and start playback. • If the mode is switched from Bluetooth® audio mode to another mode (radio mode), audio playback from the Bluetooth® audio device stops. 3. Press the button again to resume playback. or touch the on-screen button.
) or touch the on-screen button.
) or touch and hold the onscreen button. during playback of the song which you want to listen to continue the playback from that point. the song during playback repeatedly. “ ” is displayed during playback. during playback to play the songs in the device shuffle. “ ” is displayed during playback. If a Bluetooth® audio device is connected, the following information is displayed in the display. Some information may not display depending on the device, and if the information cannot be displayed, “- - - - -” is indicated.